Those bunny cupcakes look delicious. It looks like so much fun at your place, Kitty. Your grandchildren look the picture of happiness. Cute bunny garland. Traveling Nana and her cooking camp! So cute Kitty! And I love those Easter egg rocks, how clever! 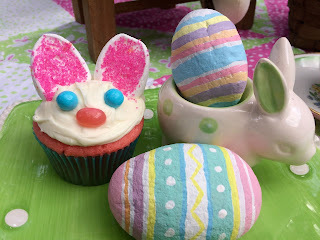 I hope you have a wonderful Easter week, full of bunny cupcakes! Such cute cupcakes, Kitty. I love all your Easter touches, and those rocks that Mike painted are so beautiful. Such cute grands and they all look so happy! Those cup cakes are darling, Kitty! Your grands are all so precious and I LOVE that you go and share lunch with them, what a dear grandmother you are. That's a beautiful tea cup your mother gifted you with and it goes beautifully with those painted rock eggs your son did up for you. Hi Kitty, Oh what sweet bunny cupcakes and how delicious they look. Yes your dear grand is very pleased at her baking and creating. She is a doll and the other little ones are too. 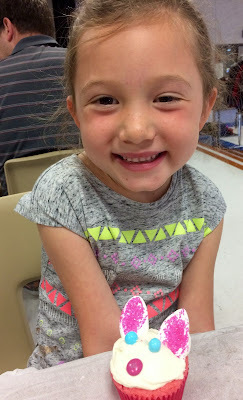 How fun to have lunch at school with Ella. What a cutie pie too. 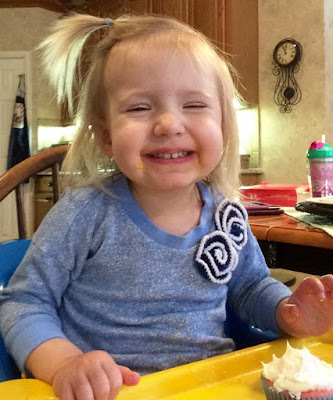 Avery is adorable and I am sure enjoyed her cupcake and sweet Harper, well she is a little darling. 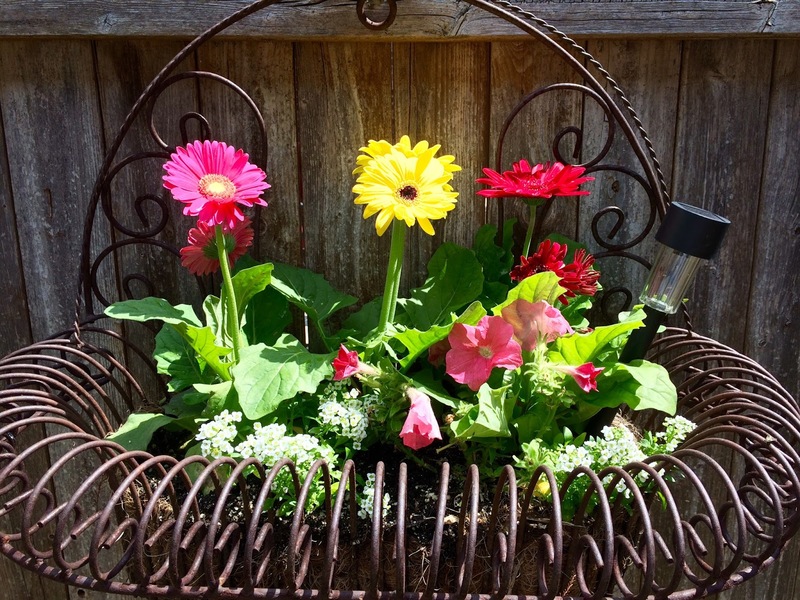 Love your beautiful daisies in that wonderful basket. I had one just like it many years ago and sadly it rusted out so bad it broke. 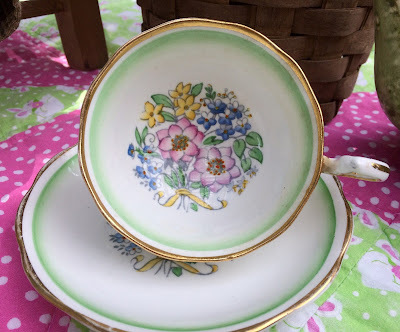 Love the teacup from your mom. What a beauty!! Have a wonderful Easter week and enjoyable holiday this weekend. Will Nana's Cooking Camp travel across the border to bring me bunny cupcakes?!? Your mom has excellent taste in teacups. I've always been partial to cups with designs inside and goldbrushed trim. At first glance, I thought that the Easter eggs were crocheted. Very cool! Happy Easter, Kitty! 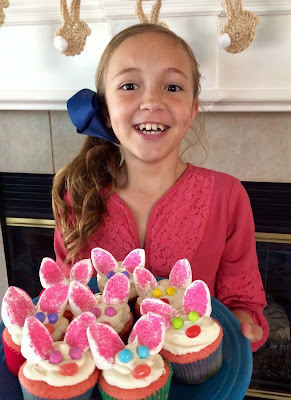 Aren't those the sweetest bunny cupcakes - and look at the happy faces! Love your post! !Thanks for sharing such hapiness!Hugs. Your sweet granddaughters are ADORABLE. You really are a wonderful g'ma. Have a truly wonderful, blessed and happy Easter, dear friend. OH my gosh! Cutest little bakers ever! Well the cupcakes are cute too but those little faces -- what memories you're creating with them. If those smiling faces and cake won't brighten your day, I don't know what will! Adorable! Happy Easter, Kitty! Oh my...how ADORABLE these sweet cupcakes are! Your little grand girls are SO cute and you can tell they are having a ball! Happy Easter to you and your family! Hugs! Have a very happy Easter, Kitty. Your adorable bunny sitting in the chair overseeing the tea party is so cute. Those cupcakes were a hit! Love seeing all the grands. Kitty, the cupcakes are almost as cute as your granddaughters! Oh Kitty, those faces are just too precious! Those smiles....too sweet for words, my friend. Your cupcakes are adorable and they look oh-so-good! And that tea cup is ever so beautiful. Much love to you! Kitty, The painted Easter eggs your son did are really nice. Looks like you enjoyed time with the grands. Have a Happy Easter. 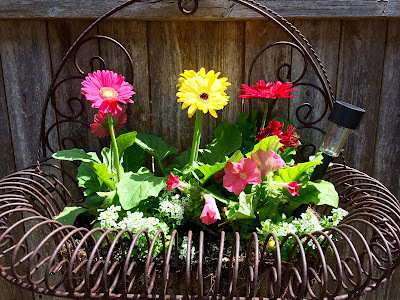 Sylvia D.
Nana's kitchen is so fun! The kids all look so happy. :) The rocks your son painted are fabulous! What talent he has!! Thanks for sharing with SYC. Oh my goodness! I just love your bunny cupcakes and obviously your grands do too! Isn't it nice to have such appreciative helpers/assistants/devourers! Thanks so much for linking to Tuesday Cuppa Tea and Happy Easter! Love it -- you'll have to get one of those magnetic signs to put on the side of your car "Nana's Mobile Cooking Camp!" I hope you have a great weekend and a Blessed Easter, Kitty. 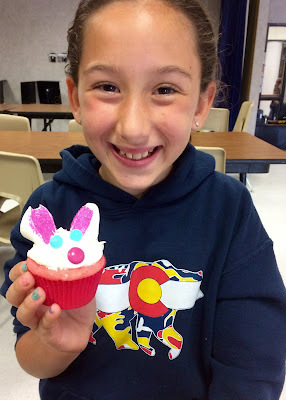 Hi Kitty, your bunny cupcakes look so cute and yummy. It's so fun that you bake with the little ones. They must have so much fun and love it in the kitchen with you! No wonder the kids are looking so happy, these cupcakes are adorable. What a delight to see those smiling faces of your grandgirls!! Precious Angels! The cupcakes are charming & look really good...one would go great with my next cuppa tea today. I'm impressed with Mike's painting skills...I never would have thought those were ROCKS!!! Hope you have a Blessed Easter, dear friend. Hugs! Looks like you were having so much fun with the Grands and the precious Rabbits. Those cupcakes sure look good, we will love them. 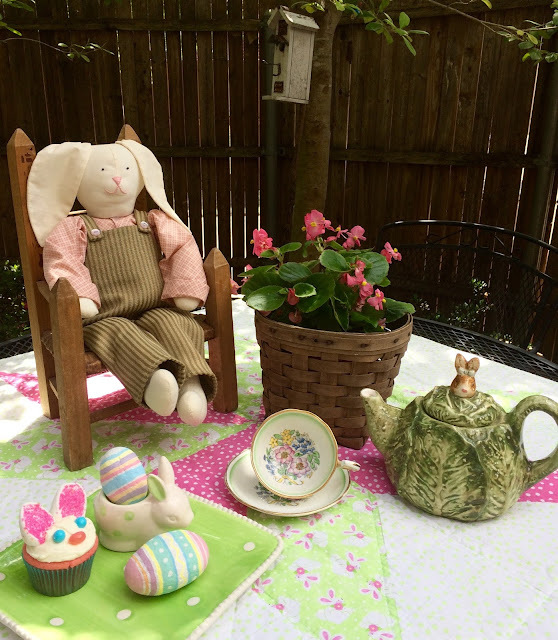 Hope you had a wonderful Easter and are enjoying the great weather we are having! Thanks so much for sharing your post with us at Full Plate Thursday and come back soon! Darling cupcakes, but nothing tops those sweet smiles. Nana Cooking Camp is obviously a favorite. Those bunny cupcakes are such a cute idea. Definitely filing this for a future Easter!